With innovative technology and quality materials, a Trane gas furnace will remain durable, efficient, and cost effective far into the future, reducing the need for heating repair in Minneapolis. 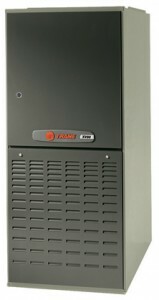 Each Trane 80 furnace functions at 80% efficiency, so that 80% of the fuel you pay for is turned into heat for your home. This AFUE (annual fuel utilization efficiency) rating exceeds the federal government requirement of 78% for new gas furnaces. The Trane XV80 is a two-stage* heating system featuring a variable-speed motor with Comfort-R™ that operates at lower, more efficient speeds than conventional blower motors and provides greater humidity control during cooling. What’s more, the XV80 features a high-efficiency motor and continuous fan mode that make every energy dollar really count, and a cleanable filter. The Trane XL80 is a two-stage* heating system featuring a four-speed blower motor for ideal comfort in the transitional seasons and at the height of winter. The Trane XR80 is a single-stage gas furnace featuring a four-speed blower motor for reliable heating that’s 80% efficient. For more information on the benefits of a home heating system or to install a Trane gas furnace in your home, contact Minneapolis, MN based Ray N. Welter Heating Company at 612-825-6867.